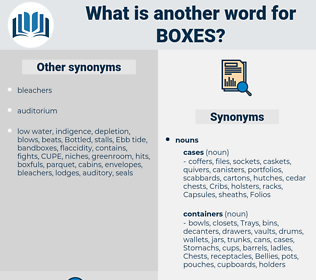 What is another word for Boxes? 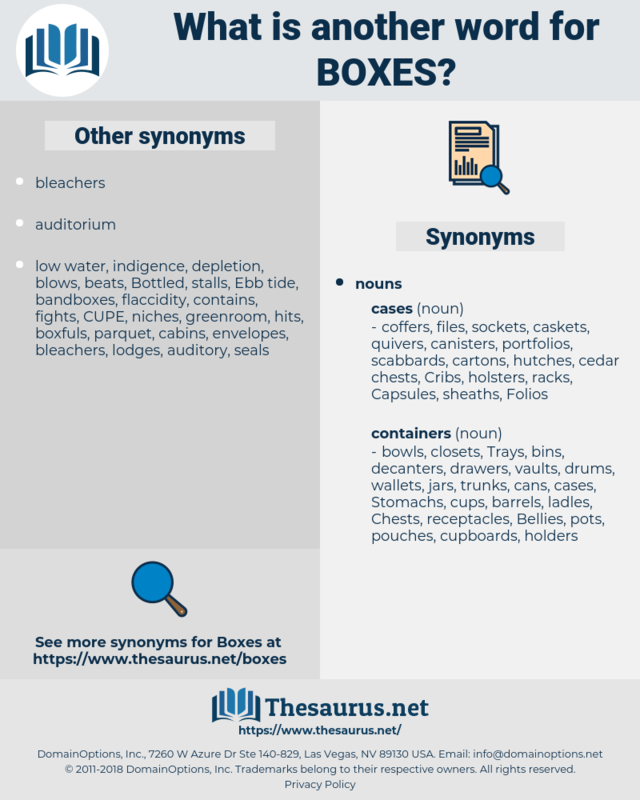 compartments, containers, rectangles, Areas, units. mailboxes, check-boxes, checkboxes, lunchboxes, caissons, cartons, caskets, crates, Chests, safes. compartments, Bodies, Administrators, tables, executives, plates, settings, fields, panels, tiles, PORTS, managers, cadres, funds, casillas, cuadros, caisses, reports, banks. reports, space, banks, us, out, tyres, S.
bottles, extinguishers, boards, Boots, co-operatives, Boats, cassettes, Households, manufacturers, bones, labels, accommodations, computers, scoreboards, packs, Bodies, processor, bollards, subheadings, receptacles, projections, closets, trailers, WINDOWS, drawers, bags, machines, Telephones, cubicles, canisters, restaurants, tabulations, payphones, ferry-boats, STBS, contributions, nightclubs, dispensers, Administrators, Packagings, enclosures, invitations, quarters, buckets, lockers, milestones, cantonments, rooms, devices, cards, Stations, consignments, professionals, protrusions, baskets, charts, pictures, Casings, interpreters, exchequers, packages, cabins, table, tables, equipments, dimensions, Records, institutions, components, tubes, Environments, dollars, systems, scopes, divisions, decoders, spheres, locations, hoops, cylinders, cabs, vouchers, appliances, shipments, packings, phones, contexts, category, Categories, multiples, aircraft, silos, minefields, pigeonholes, cobbles, rails, responses, chambers, pieces, shops, executives, Groceries, scorecards, modules, pillars, bundles, commissions, rubrics, Burrows, Matrices, outlets, stalls, papers, polls, Killings, shutters, plates, settings, Companies, positions, individuals, patterns, Cribs, pots, finances, cabinets, housings, racks, fields, chassis, stacks, offices, portions, committees, paintings, cages, treasuries, favours, Carriers, trucks, bunkers, coffers, holders, Tracks, clubs, Traps, grid-cells, tanks, schedule, Schedules, appellants, bars, vault, vaults, tubs, headings, engines, Shelves, spaces, locules, Branches, Cells, topics, kilometres, Marcos, items, parcels, TOTES, bins, zones, homes, tiles, BACS, registers, lodges, columns, planes, tiers, Stones, blanks, vessels, shells, BRICKS, schemes, shafts, cans, trunks, marks, kennels, gears, strands, hours, assets, clusters, Owls, presents, kit, kits, cars, basins, packets, posts, squares, centers, Entities, chapters, drums, Forums, Fora, Bays, Insurances, huts, hampers, Elles, managers, tires, bucks, centres, Bureaus, grounds, pounds, bunks, Classes, cracks, ledges, arrays, sets, urns, titles, joints, Replies, GRIDS, Ones, slips, cadres, meshes, Entries, funds, TINS, PCS, casillas, answers, streams, pinks, trusts, inches, careers, sides, VOTES, FACETS, LANES, figures, Ferries, pans, Forms, places, Phases, grades, accounts, teams, DENS, caisses, yields, unions, Pens, wins, LINEs, Cas, banks, tyres. They punish but they do not avenge when they sit in jury boxes. A porter ran from the hall for their boxes.